Proclamation of the Republic of West Papua: As a protest against the fraudulent Act of “Free” Choice in July / August 1969, brigadier-general Seth J. RumkoremÂ and Jacob Henderik Prai (Chairman of the Senate), proclaimed the independence of the Republic of West Papua on 1 July 1971. Others who singed the proclamation were; Mr. B.M Tanggahma, Mr. F.T.J. Jufuway, Mr. D. Maury, Mr. H. Womsiwor, Mr. D. Kereway and Mr. S.T. Tan. The proclamation has been declared in Port Numbay, in the headquarter of Markas Victoria. The Papuans decided to proclaim the Morning Star Flag as the National symbol; they did the same with the national anthem (Hai Tanahku Papua) and state seal (One People One Soul). The National Liberation Council of West Papua in the Netherlands gave the advice to Mr Seth J. Rumkorem and his men to carry out the proclamation, before the general elections in Indonesia. 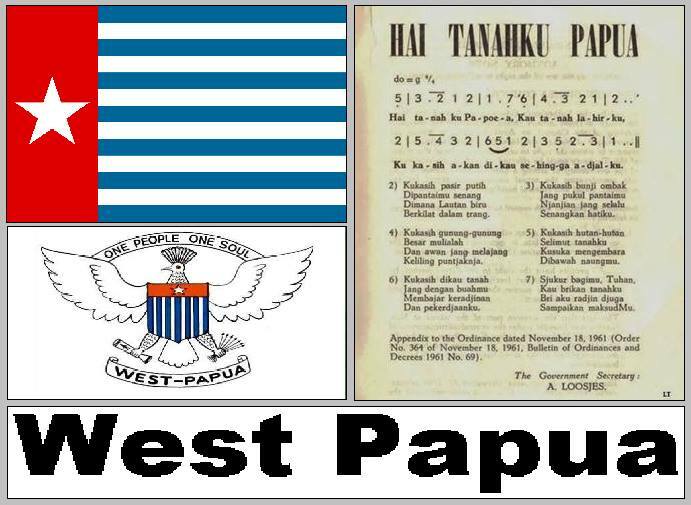 This act, the independence proclamation of West Papua, was a manifestation of the yearning wishes of the West Papuan people, to be free and independent. Under Article 2 of UN resolution 1514: â€œAll peoples have the right of self-determination. been proclaimed to be free and independent (de facto and de jure) May God be with us, and may the world be advised, that the true will of the people of Papua to be free and independent in their own homeland has been met.